In 1951, the brothers Friedrich and Heinrich Trox founded a company for the production of air terminal devices, Gebrüder Trox GmbH. Production started on the private property of Heinrich Trox in a hall measuring 110 squared metres. Just two years after the company was founded, Heinrich Trox took over his brother's shares in the company, making him a sole shareholder. In 1954, TROX employed 75 people and it began constructing a new production and administration building in Neukirchen-Vluyn. In 1960, Heinrich's sons Klaus and Heinz Trox joined the company. In the same year, TROX began construction of its own research and development centre for acoustics, fire protection, filter technology and aerodynamics. In the 1960s, the first foreign subsidiary companies were founded. In 1968, Heinrich Trox, who died two years later, appointed his two sons Klaus and Heinz as CEOs. In the 1970s, the company became the market leader in Europe. Following the death of Klaus Trox in 1988, Heinz Trox became Chairman of the Board of Management until 2001. In the subsequent years, the product range as well as the number of internal subsidiary companies grew substantially. In 1998, TROX acquired the Swiss market leader for ventilation components, Hesco AG. In the year 2000, TROX acquired FSL, Fassaden System Lüftung, from Mannheim, thereby expanding its product range with decentralised ventilation systems. 2005 saw the acquisition of the Norwegian market leader Auranor AS. In 2006, the former Gebrüder Trox GmbH was renamed TROX GmbH and the worldwide group of companies became known as the TROX GROUP. The International Center Fire Protection was built in 2009 at the TROX Group International Head Office in Neukirchen-Vluyn. The installed test facilities enable fire tests to be performed in accordance with all the established international standards for fire protection-related classification of building materials and components. In 2011, TROX began developping, producing and distributing air handling units and became a member of the German Association of AHU Manufacturers (RLT Herstellerverband). With the acquisition of the Building Fans division from TLT-Turbo GmbH in Bad Hersfeld, TROX entered the market for ventilation and smoke exhaust fans for buildings. 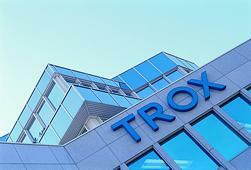 On 1 October 2012, the company changed its name to TROX TLT GmbH. The production of air handling units (X-CUBE) and the acquisition of the TLT Building Fans division (X-FANS) from Siemens have enabled TROX to manufacture virtually all the components that are essential for a central air conditioning system itself. Today, TROX has 25 subsidiary companies, turnover of over 400 million euros and 3,650 employees in over 70 countries on 5 continents.